Venice Beach is the most eclectic beachfront on the West Coast. Known for its circus-like boardwalk called Ocean Front Walk and extraordinary canals, Venice Beach is truly a one-of-a-kind neighborhood. From funky shops and boutiques to street performers and an assortment of entertainers, you’ll never run out of things to do in Venice Beach. The Venice Beach Boardwalk is one of the most visited attractions of Los Angeles. The Venice Beach Boardwalk expands 3 miles long next to the Pacific Ocean with cafes, restaurants, quirky shops, and vendors lining the beachfront boardwalk. Home to decades of famous musicians, artists, and entertainers, Venice Beach encompasses that artsy culture even today at the boardwalk. 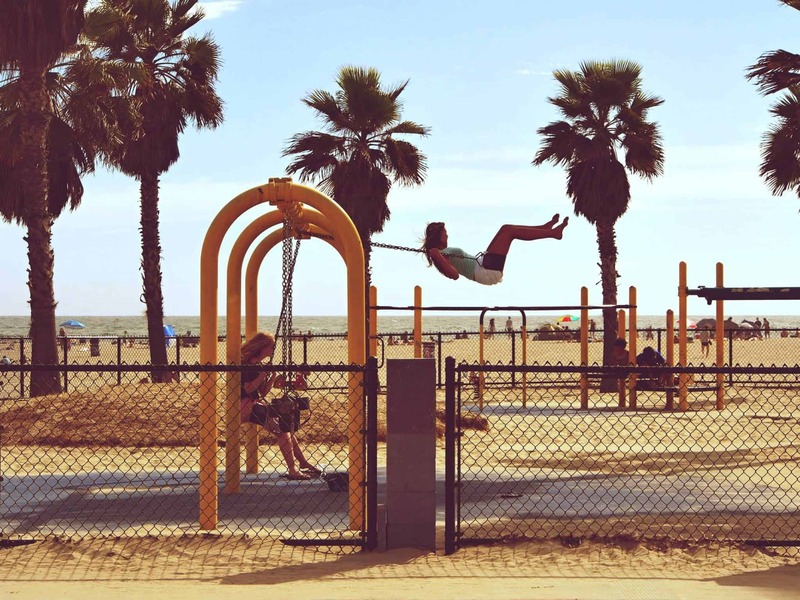 Lots ofoutdoor activities and sports are fun to watch or play, for a far out adventure, the Venice Beach Boardwalk is what you’re looking for. A unique feature of Venice Beach is the canals that were structured way back in 1905 by Abbott Kinney. These canals used to stretch 16 miles but over time, the canals were paved over. Now the remaining canals can be found in a few blocks and they’ve been fully restored. These canals are great for a stroll or to paddle around the romantic canals. This boulevard oozes trendy fashion and unique hotspots. Abbott Kinney Boulevard has a huge selection of independent shops, interesting restaurants, and nightclubs. Known for its artsy flair, you can find just about anything you need on Abbott Kinney Boulevard. The boulevard will be closed off for September 29th for the Abbott Kinney Festival. The Venice Beach Bike Trail is great for a day of biking or skating. The bike path spans from the sands of Venice up the beautiful coast to Santa Monica, This place is popular for bike riding and skating therefore many rentals are available. Don’t want to miss out on a white Christmas? You don’t have to! The gorgeous Lake Tahoe area is known for its ski resorts, winter sports, and cozy cabins. Take a trip from San Diego to Lake Tahoe; the short drive and beautiful scenery are perfect for a weekend vacation. Check out these great things to see and do while enjoying your time in Lake Tahoe! This is a skiier’s and snowboarder’s paradise! Squaw Valley Ski Resort is comprised of 4,000 acres sprawled across 6 mountain peaks of the Sierra Nevada Mountains. Squaw Valley Ski Resort is great for any level of expertise from beginner to advanced. With 30 lifts and lots of great areas to ski and snowboard, Squaw Valley Ski Resort is the perfect destination for the ski and snowboard enthusiast. Emerald Bay State Park has been a National Natural Landmark since 1969 and its beautiful panorama of mountain ranges, glacier-carved granite, and unique islands will take your breath away! 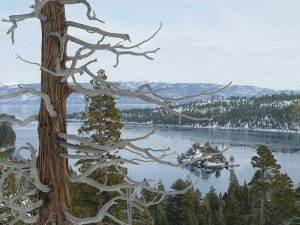 As a highlight to any Lake Tahoe trip, Emerald Bay State Park offers many different things to do like hiking through the Rubicon foot trail wraps, appreciating the Scandinavian architecture found at Vikingsholm, and enjoying a cup of tea at the Tea House on Fannette Island. If you really want to get in touch with nature, Emerald Bay is the place to go! 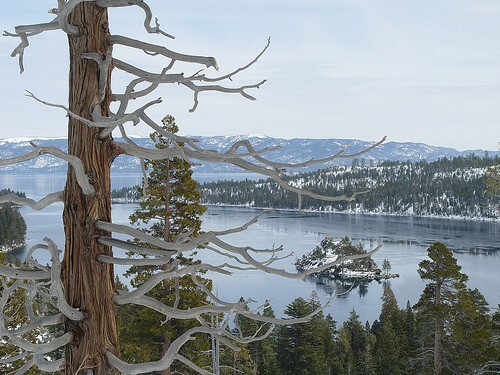 Want to catch a glimpse of the picturesque Lake Tahoe area? Then, you must take The Gondola at Heavenly Ski Resort. The 2.4 mile ride will amaze you through the natural beauty of the Lake Tahoe area. For a trip that will leave you breathless, visit The Gondola at Heavenly. The Tallac Historic Site is a combination of the Baldwin Estate, the Pope Estate, and Valhalla. House tours and site tours will give you a feel of what it was like to live in Lake Tahoe during the 1930s. Take a special workshop or have tea with the head of the house! For a piece of history about Lake Tahoe, you must see the Talla Historic Site. Locals and visitors flock to Sierra Mountain Sports of Lake Tahoe to get their fix of snowmobiling! Located near South Lake Tahoe, Sierra Mountain Sports of Lake Tahoe is great for first-time snowmobilers and more experienced riders. If you’ve never been on a snowmobile before, you’ll feel comfortable trying it with the friendly staff at Lake Tahoe’s Sierra Mountain Sports. Business travels sound like a lot of fun unless it’s you who is paying for the expenses. Travel acts like a catalyst for spurring business growth. According to World Travel & Tourism Council, business travel has accounted for one-third of the global trade growth in the past decade. Business travel enhances corporate productivity and creates job openings; hence, it’s indispensable for business organizations to send their employees on business trips. Nonetheless, no professional organization can afford to burn the candle at both ends and squander away money unnecessarily. According to a study conducted by The Global Business Travel Association and cited byÂ CNBC, business travel is projected to increase by 7.2% in 2014, reaching a whopping $288.8 billion. For each dollar spent on business travel, companies earn $2.90 in profits, according to US Travel. In order to maximize the ROI on your travel investment, it is mandatory that you spend your money well. The price of the air tickets, entertainment, food, and short term corporate housing in San Diego, all must stay within the budget that you have allocated. Here are 10 money-saving tips for your next business trip to San Diego, tips that can cut your expenses substantially and save you tons of money. 1. Avoid Summer: Summer is the high season in San Diego. The weather is pleasant and tourists gravitate to the beach city, driving the accommodation rents sky-high. If you can, you should either defer your business trip to late fall or arrive here in early spring. You’ll find plenty of vacant corporate housing communities in San Diego and the rents will be suppler than in summers. 2. Avoid Major Events and Festivals: Check San Diego’s event calendar to avoid the rush days and busy weeks. For instance, the LGBT Pride Parade is scheduled from July 19 to 20.Â Expect busy roads and hotels on these days. 3. Save on Air Travel: Do a little research on low-cost airlines that offer some level of quality and comfort. JetBlue, Southwest, and Air Tran are some such “no-frills” airlines. Look for seasonal discounts and special offers. If you are a frequent flyer, you should get yourself enrolled in the incentives programs offered by some of the airlines, so that you can buy cheaper tickets. Try to buy refundable, one-way tickets, as these can save you some money while allowing you the flexibility of extending your stay at the corporate housing in San Diego, should the need arise. 4. Merge Your Business Trips: It is also advisable to merge 2 or 3 business trips together; this will reduce the number of flights that you have to pay for. Once you have made your flight plan, look for affordable corporate housing in San Diego. 5. Stay Close to Downtown San Diego: Beachfront accommodations are usually expensive. You’ll also need to bear the transportation expenses, as you’ll need to travel to the city center often for your business or entertainment activities. Downtown hotels are cheaper than beachfront hotels in San Diego. It is better if you can find San Diego corporate housing such as that offered by Foxwood apartments. These corporate apartments will be economical as compared to hotels and will give you the luxury and privacy of a country club lifestyle. 6. Negotiate Corporate Deals and Discounts: Business travelers can usually get discounted hotel or apartment rents if their employers or sponsors have negotiated a deal with some of the properties. If you are an entrepreneur or SMB owner who needs to travel to San Diego quite often, you should contact the management of some of the San Diego corporate housing establishments and try to negotiate exclusive low rents for your employees and/or yourself. 7. Save on Transportation: There are several places in San Diego that you can visit without having to rent a car. There are roads in San Diego that practically turn into parking lots around rush hours. 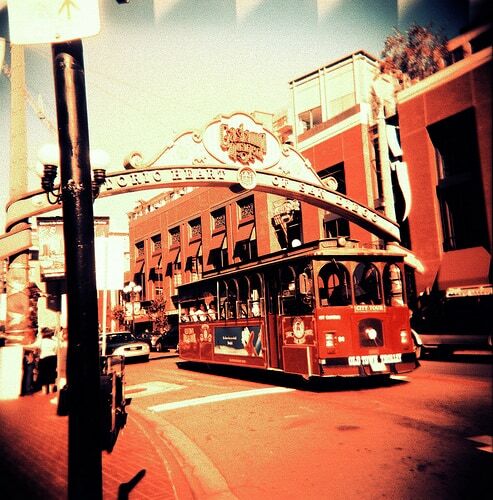 You should make yourself conversant with the San Diego Trolley and make use of it to save money and hassle. You can rent a car only on certain days, when you need to go somewhere that the Trolley wouldn’t take you. 8. Save on Food: Eating at restaurants or commercial food outlets can weigh heavily on your pocket and stomach. One of the benefits of staying at San Diego corporate housing is that you can cook or heat up your own food. Plan your trip in a balanced way, combining dining out and cooking at home in equitable proportions. You’ll find plenty of economical, yet good quality restaurants in Hillcrest Area. 9. Save on Sightseeing: No business trip to San Diego is complete unless you’ve entertained yourself at some of the recreational facilities that the city offers in abundance. If you have time, you should get a Go San Diego pass, which gives you the right of admission into 47 of the best San Diego attractions. There are plenty of other passes and special offers available, which you can avail to save money during your business trip. 10. Be Free: Try to be as independent as you can; buy your own grocery and cart your dirty clothes to a local drycleaners rather than paying the hotel twice the money. Your corporate housing in San Diego comes with free parking, laundry, swimming pool, and spa, not to mention the attached kitchen where you can cook for yourself. In business, a dollar saved is a dollar earned. If you are not careful while planning it, the cost of your business trip may shoot through the roof without you even noticing it. It is only when you add up the expenses afterward that you realize that your trip could have been more cost effective. While you should not starve yourself of the pleasures and fun of a trip to San Diego, unwanted expenses ought to be curbed. Your business trip will probably pay you off many times the amount that it costs, but the profits will come later on. 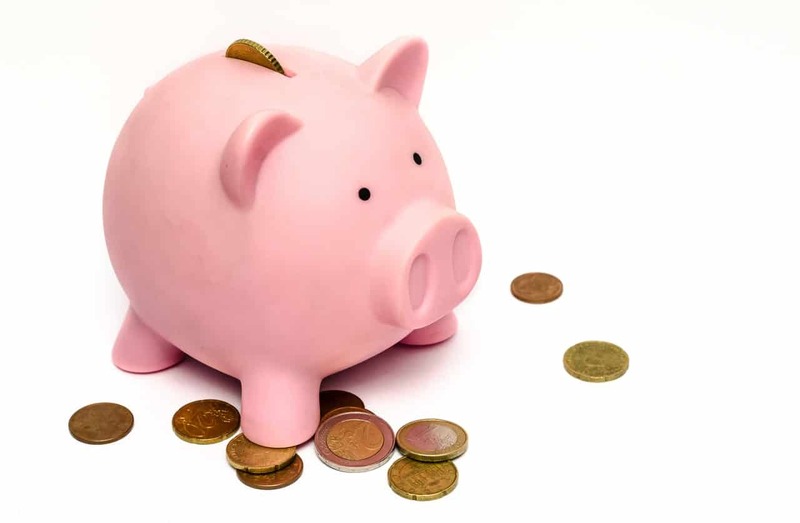 For the time being, you should focus on saving cash expenses. Would you like to offer us any tips for saving money on a business trip to San Diego? Please do comment on this post and don’t forget to share it with your friends and colleagues. Feel as if you’re worlds away from the hustle and bustle of city life. The Channel Islands National Park is the perfect escape from everyday life or the usual getaway. Comprised of five gorgeous islands and vivid ocean environments out of an 8-island chain, the Channel Islands National Park has been preserved and protected for decades. Among the plant and animal life, it has flourished in these natural hot spots and created a habitat that’s completely different than all the others. The most incredible part of Channel Islands National Park is definitely the isolation it has had from developing lands. Over thousands of years, these islands have cultured and created plants, animals, and other resources that have not been found anywhere else in the world! Channel Islands National Park has preserved a world that has been seen by very few eyes. This national park has limited accessâ€¦ and it’s one of Southern California’s best-kept secrets. 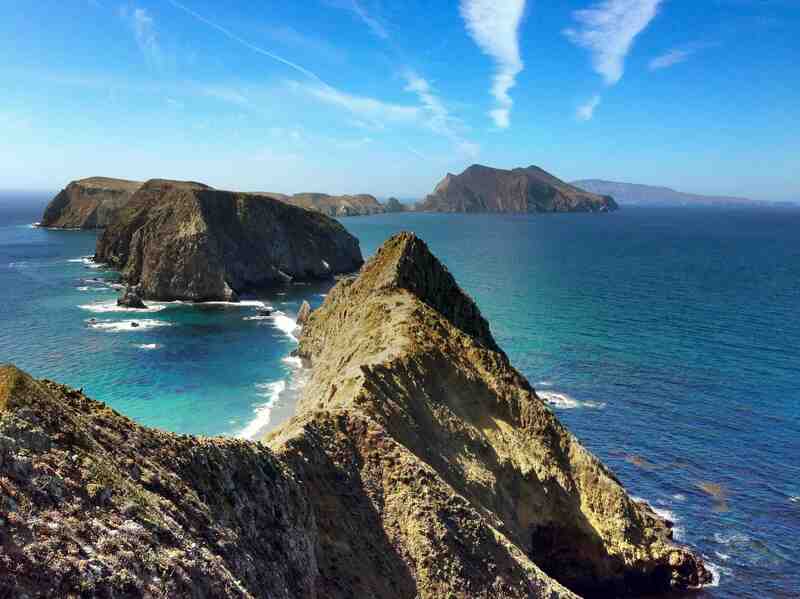 As one of the least visited of all American national park, Channel Islands is challenging to get to; only boat rides and small jet flights can get your party to this national park. A Mom and Pop shop called Island Packers has been in business since the â€˜70’s taking passengers by boat to seven different destinations along the Channel Islands. Island Packers offer year-round transportation. The Channel Islands are called Anacapa, Santa Rose, Santa Cruz, Santa Barbara, and San Miguel. Along with its wide variety of specimen, there are also lots of fun attractions for visitors to do during their visit to Channel Islands National Park. Scuba diving, snorkeling, whale watching, fishing, kayaking, and camping are all popular pastimes for visitors. Whale watching is a great activity for the entire family. The ocean environment surrounding the Channel Islands is home to many different whales. Blue whales and humpback whales flock to this area during the spring and summer months. If you like a little more activity, fishing is a great choice. Boats go out each day filled with fishing enthusiasts that are eager to go to the Santa Barbara Channel where the fishing conditions are ideal. As the mecca of sport fishing, many professionals also love to fish in this area. And, if you’re feeling very outgoing, the Channel Islands are also great for kayaking and camping. Spend your days living off the land and traveling by kayak to all of the islands’ beautiful surroundings. One-day and multiple-day passes are available to Anacapa Island and other islands. The best places to see during your kayaking journey are Giant Kelp Forests, Natural Sea Caves, and Sea Lion Rookeries. Have an unforgettable experience that few others get to do, travel to Southern California’s Channel Islands National Park. Are you coming to San Diego for a business trip, extended vacation, or military duties? With the always dependable and very convenient bus and trolley system of San Diego, traveling around town will be extremely easy. The San Diego bus and trolley schedules showcase just how reliable the public transportation truly is. With buses arriving every 15 minutes, you can rest assured that you’ll be on your way to the office or the beach in no time at all. At our apartments, the 933 bus station is on Delcardo Avenue just across from Foxwood Apartments. Simply cross the street and hop on the bus to find your way into downtown San Diego, Coronado, Mission Valley, Old Town and even the U.S./Mexico border. The opportunities are endless when you stay with Foxwood Corporate Apartments, which is close to public transportation any time you need it. If you’re looking for military apartments, Foxwood Corporate Apartments is also a great off base location near the San Diego Naval that is ideal for your military housing needs. The 32nd Street Naval Base and North Island Naval Air Station are just 10 minutes away from our apartment complex. Take the public transportation next door and you can be on the job in minutes. Here at Foxwood Corporate Apartments, we offer luxurious temporary stay apartments that are furnished with upscale furnishings and garnished with relaxing amenities. The addition of convenient access to public transportation is just another perk to living at Foxwood Corporate Apartments in San Diego. View maps, timetables, and other documents regarding the public transportation on our website. You won’t believe the multiple benefits you’ll endure during your temporary stay with Foxwood Apartments.